A big general question, in terms of magnification where is the limit between macro- and microphotography. I know that for some of you, this is a long discussion. - flashes and diffusers, tripods, etc. As mineralogist, my main interests are minerals. But I'm a little bit confused regarding where is the limit between macro- and microphotography. These limits are arbitrary, you can see different definitions at different sources. This is an endless discussion. - If you use another optical setup (including microscope objectives on extension or tube lenses, which in fact are simple microscopes) it belongs to "macro and close up"
You can see here images taken at 5X through a microscope and 50X images at the macro section...a bit weird, isn't it? But if we apply your rules....1X image at a m4/3 sensor and 1X image at a Phase One are kinda of different: different field of view and different final magnification when filling the same computer screen. It's also weird. Arbitrary doesn't mean absurd, each division has its own usefulness but no one is better in all senses. Dear Pau, thanks for your observations. If we look on a very simple microscope, without the polarizer or other filters, we can compare it with a camera + extended tubes and microscope objective. The only difference here is the path of the light and the distance between camera sensor and objective, right? This is the reason why I prefer (at this moment) to consider firstly the magnification ratio, rather than optical/technical setup. As you said, we can obtain with the microscope 5:1, but also with the mp-e65 objective. This is another point of view, as you said - is arbitrary. This and similar distinctions can be based on several different things. This results in different definitions, and the choice of one of them over the others is often based on personal preferences, habit, type of subject and type of equipment. The following are my thoughts, but there are possibly as many different opinions as members of this site. For example, it appears that macrophotography was created by marketers. For a purist, and considering that photomicrography is generally regarded as the correct term to indicate photography through a microscope (regardless of magnification), photomacrography would be the corresponding term to apply to photography through a macro lens, regardless of magnification. In practice, however, macrophotography is such a common term that we cannot hope to get rid of it, so we should better use it. Accordingly, since most traditional macro lenses focus from infinity to 1x, the 1x magnification is often used as the highest magnification in the macrophotography range. The lowest magnification in this range is open to discussion, and overlaps with close-up photography. 0.1x, 0.5x and other magnifications have been proposed. The 1x upper limit ignores the fact that many legacy macro lenses, and even some modern ones like the CoastalOpt 60 mm, only reach 0.5x without an additional extension tube. This is just a detail. Another detail is that there are a few lenses that cover parts of both the macrophotography and photomacrography magnification ranges. Are they macrophotography or photomacrography lenses? I don't really care. The photomacrography range is usually taken to begin at 1x and to go higher, albeit the term is generally restricted to imaging with a simple (non-compound) optical system, e.g. a lens, microscope objective or infinity-corrected objective with tube lens. The term photomacroscope is sometime used to indicate a microscope look-alike that lacks separate projection optics ("photo eyepiece") in front of the sensor. This made sense when large-format film was used, but today it is common to use small-sensor cameras in this configuration even on high-magnification scopes, so the distinction is blurry. Briefly, it appears that the only "hard" magnification limit between categories is 1x. The other distinctions are based on type of equipment, not magnification. Of course microscopes offer a higher maximum magnification than direct projection, but there is no hard, undisputable border wall between photomacrography and photomicrography based on magnification alone. Thank you for your opinion regarding my misunderstandings. Sorry for the confusion between photomicrography and microphotography. I will adopt the division of PMG community regarding -micro- and -macro-, as Pau and you pointed out. One more question, the images acquired with a stereomicroscope can be defined also as photomicrography? Later edit: If I remind correctly, in literature, the images obtained by using a microscope are captioned as photomicrographs. But also, other authors use the term 'microphotographs' (manuscripts published in journals with high impact factor like Science, Nature, etc.). yes, a stereomicroscope is a compound microscope, so in principle it should be regarded as photomicrography, especially if one couples the camera in an afocal configuration (with the camera lens pointed into an eyepiece), or with a dedicated photo eyepiece. Also in this case, it is sometimes possible to remove the eyepiece and directly project an image from the microscope objective to a small sensor, so - strictly speaking - one could call this configuration a macroscope. On the other hand, Wild and Leitz used to make a low-magnification compound photomicroscope with an afocally coupled camera through an eyepiece, and call it "Makroskop", so also in this case there are different opinions. This statement is simply not correct. While reading one of the old books referenced in Charlie Krebs' latest post, I ran into what claims to be the first & defining use of the term "photo-macrograph"
It's in "THE A B C OF PHOTO-MICROGRAPHY / A Practical Handbook for Beginners", W. H. Walmsley, 1902, currently available online at Google Books as http://books.google.com/books?vid=LCCN02029905&id=T29KZKfdMTIC. Photo-macrography. Worcester defined Macroscopic or Macroscopical as "noting an object which, although comparatively minute, is visible to the naked eye or to the eye assisted by a pocket lens," -- usually an inch or more in focus and magnifying less than ten diameters. A delineation or picture of an object thus enlarged would be a macrograph, and if produced by the aid of photography, why should it not be termed a photo-macrograph? At all events I have chosen to coin that word and to define it as a slightly enlarged picture or delineation of a macroscopical object produced by means of a lens and sensitized photographic plate. Macroscopic denotes an object of minute proportions, but visible to the naked eye, or by means of a pocket lens, and does not require the use of a microscope. An enlarged drawing of such an object to the extent of a few diameters is termed a macrograph: if made by the aid of cameras, why not a photo-macrograph? There is an endless number of such objects, which may be enlarged by the aid of a suitable camera and photographic lens from one to about ten diameters -- the limit of a pocket lens of one-inch focus. I have ventured to coin the word photo-macrograph in this connection, and descriptions of the method of making them, together with illustrations, will be found in Chapter V, under Negative Making. For this current discussion, it is perhaps particularly relevant that Walmsley defined his new term, "photo-macrograph", to describe a particular type of result that was obtained by shooting with his microscope! In any case, it is clear that the light does not care what we call the process. If you want to take a picture of a small object, then the important thing is to use a lens that performs well for that purpose. Most such lenses were designed for use in microscopes, and can be found in catalogs under the heading of "microscope objectives". In recent years, the phrase "extreme macro" has sprung up to describe the use of such lenses with camera and illumination systems that otherwise look like ordinary macro systems. Here at photomacrography.net, the gallery named "Photography Through the Microscope" is distinguished from "Technical and Studio Photography" based on one simple criterion. If the photograph was taken using equipment that the manufacturer called a "microscope", then the image goes in "Photography Through the Microscope". Otherwise it goes in one of the other galleries, usually "Technical and Studio Photography". The reason for this distinction is that the specialized mechanical frame and structured illumination systems provided by commercial microscopes give both limitations and opportunities that are different from more "open" systems that happen to use a microscope objective as the primary lens. By grouping images this way, we hope to make it simpler for members to interact with other members who are doing similar work. The distinction may appear arbitrary, but in fact it was carefully considered and debated at length, something like 10 years ago. Andrei, I am curious to know more about your actual interests. Are you hoping that knowing the terminology will help lead you to better techniques, or is there some other reason? Thank you very much for the great references and also for your opinions. Currently, I'm teaching mineralogy and I want to define the difference between my photos taken at stereomicroscope, at the petrographic microscope with plane polarized light and crossed one, with dedicated macro lenses, and also from 'extreme' stacked photos acquired with homemade CNC + microscope objectives. I want to organize them and also to use the appropriate terminology in my further teaching and research activities. For example, in my last research (http://www.sciencedirect.com/science/article/pii/S0169136815300676), for the photos obtained with a petrographic microscope, I used the term "photomicrographs". If I'm not wrong, for the other photos (with the exception of stereomicroscope) are defined as photomacrography, right? IMO yes, but often beyond terminology and even optical equipment what actually matters is the size of the pictured subject and the preparation and illumination used. Adding scale bars could be the most practical and accurate solution. As you very likely know this is requested in many scientific papers, and for a good reason. You can make excellent petrographic images with a macro setup just putting the petrographic slide between crossed polars under transillumination. I've done it when preparing my Petrography presentations, it's very useful for coarse grained rocks. The article at sciencedirect.com is mostly hidden behind a paywall, so I cannot see any of the photographs. Based on your description, the terminology seems fine. The origin of the term "photomacrograph" is now well established. A blessing - or curse, depending on the point of view - of technical and scientific terminology is that it changes its meaning with time. Throughout the literature, countless examples quote the original source of a term, followed by a statement to the effect that the original meaning of the term is not adhered to by the current author. About as often, no original source is quoted, and only the author's meaning is specified. A few examples of definitions from the literature of the four terms that we have been discussing (close-up photography, macrophotography, photomacrography and photomicrography). The list is far from complete, and in no particular order. (unknown author) 1977: Close-up photography & photomacrography. Kodak publication N-12. Earlier published in 1969 as N-12A and N-12B. p. 78: "Photomacrography is a link between the techniques of close-up photography and photomicrography." p. 79: "Photomacrography (...) The term should not be interchanged with macrophotography-the making of large photographs, such as photomurals." p. 79-80: "Photomicrography is done with the compound microscope"
p. 83: "The simple [my note: as opposed to compound] microscope for photomacrography can be obtained in many ways. Basically, a supported camera with a long bellows and a lens of short focal length constitute the setup." Bracegirdle 1995: Scientific photomacrography. Bios Scientific Publishers. Bracegirdle & Bradbury 1995: Modern photomicrography. Bios Scientific Publishers. White 1987: Photomacrography. Focal Press. p. xi: "The definition and use of the term photomacrography is nowhere settled." The book discusses both simple and compound optics. Shaw 1987: Closeups in nature. Amphoto. The book defines "closeup" in an inclusive way, including 1x magnification and higher. Blaker 1977: Handbook for scientific photography. Freeman. p. 82: Uses the term "closeup [flash] photography" for magnifications 0.25x to 3x-6x. p. 91: "Photomacrography can be described as photography at image magnifications greater than actual size that is done without the use of a compound microscope." Blaker 1976: Field photography. Freeman. p. 324: "Photomacrography, making use of a single objective lens, as in normal photography..."
Ray 1999: Scientific photography and applied imaging. p.223: "...photomicrography is a two-stage magnification process. Photomacrography is a single-stage recording process where a magnification of unity or greater is achieved, while macrophotography is the production of enlarged images..."
Williams 1984: Close-up photography and photomacrography. In Morton (ed.) Photography for the scientist, 2nd ed., Academic press. p. 355: "close-up photography... a magnification range of say 1:20 to 1:1." p. 355-356: "Photomacrography... approximately 1:2 to 30:1 and always involves the use of either extension bellows and tubes or specialized lenses." p. 356: "...after 30:1 to use a compound microscope... then called photomicrography.". Vetter 1984: Photomicrography. In Morton (ed.) Photography for the scientist, 2nd ed., Academic Press. p. 393: "Photographs made through the compound microscope are called photomicrographs." Martinsen 1968: Photography of specimens. In Engel (ed.) Photography for the scientist, Academic Press. p. 451: "Photomacrography is the term reserved for photography of small objects... The lens is, at times, referred to as a simple microscope, as opposed to the compound microscope used in photomicrography." Tölke & Tölke 1971: Macrophoto and cine methods. Focal Press. p. 9: "Macrophotography thus embraces all those close-ups and macrophotographs which lie between photomicrography and normal photography." Lefkowitz 1979: The manual of close-up photography. Amphoto. p. 24: "The close-up range... 0.1x..up to 0.5x", "Extreme close-up... 0.5x-1x", "Macro range ... above a ratio of 1:1", "conventional lenses used in reverse, teleconverters, true macro lenses, and long bellows... up to 35x, are the upper limit of photomacrography", "For greater magnification, a microscope is necessary, and the process of taking pictures through one is called photomicrography." @Rik here you go the .pdf file (link to pdf), see fig. 11 / page 15 from the pdf file. The photomicrographs are acquired by using reflected light microscopy technique. @Pau when you say to put the petrographic slide between crossed polars you mean this type of photomicrographs? Short description: Oscillatory zoning of Plagioclase mineral/crystal. The zonation texture developed during rapid cooling of the magma and reflects the mineral chemistry oscillations (high- and low-temperature). Technique: Polarized Light / crossed polars. 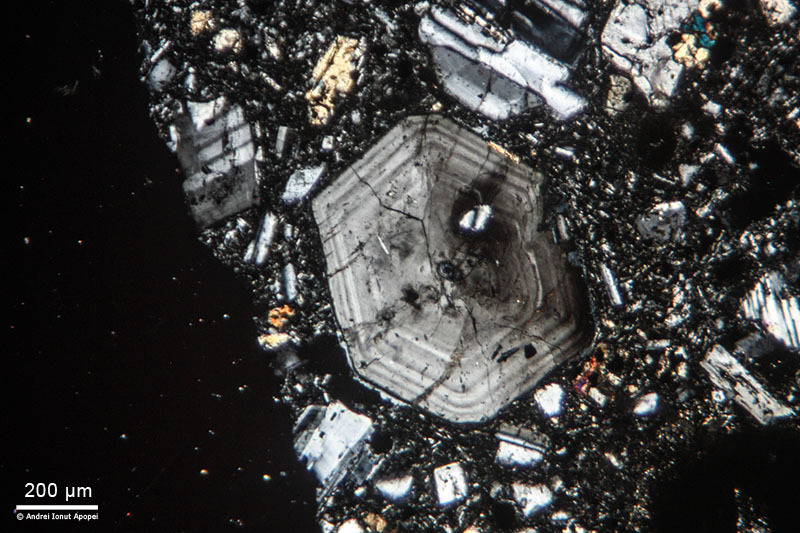 Andrei, a nice zoned plagioclase phenocrystall!, a mineral I like very much under the microscope. Yes, I was referring exactly to this this kind of images of rock thin sections when I needed lower magnification to show the general texture of a coarse grained rock or I wanted to compare it with a plain reflected light macro image of a hand sample. Andrei, thank you for the link to the full article. I have searched for and looked at all occurrences of "micro" and "macro" that appear in the paper. Everything I see looks perfect. In figure 11, the 100 µm scale bars indicate that these images range from 80X to 160X as printed. These definitely qualify to be captioned "micro", as you have them. That would be true even if they had been shot using an open system that would place them in the Technical & Studio gallery here at photomacrography.net. In figure 8, the 5 mm scale bars indicate that the images range from 2X to 3.4X as printed, with maximum subject width about 24 mm. Those images can appropriately be called "macro", as you have them, and in my opinion that is true even if these latter images were shot through something like a stereo microscope, as suggested by the round frame on the lower magnification images. If shot through a microscope, then they could also be labeled as "micro" without offending anybody, but just personally I think that "macro" is more appropriate and communicates better. Whalmsley W.H. 1899: Photo-micrography for everybody. International Annual of Anthony's Photographic Bulletin and American Process Year-book. 12: 73–90. p. 73: "and under the lower, or five diameters, may be readily produced by any form carrying a lens of short focus, a bellows, or other means of extension, and a focusing screen. The picture thus made may be termed a photo-macrograph, as a distinction from the true photo-micrograph produced by the combination of microscope and camera."